Energy use has been cut by 27.3 per cent in 10 years by CDL, the global Singapore real estate company. The group, which has a presence in 26 countries, reports it has hit its 2030 target of a 25 per cent reduction 12 years ahead of time. The reduction is one of a list of achievements in CDL’s 2018 integrated sustainability report. To fill out its claim, the company reports that energy efficiency and other measures cut electricity bills by more than S$20m ($15m, £11m, €12.5m) between 2012 and last year at eight of its managed commercial buildings. During the same period, CDL’s overall carbon dioxide emissions fell by 32.8 per cent putting the company well on track to meet its 2030 target of 38 per cent. More progress is flagged up for the Green Mark certification awarded for premises by the Building and Construction Authority of Singapore. Altogether 75 per cent of CDL buildings now carry the mark, placing the company ahead of the game to reach its 2030 target of 80 per cent. In the past year the group has expanded its stakeholder involvement by issuing Singapore’s first Green Bond and raising S$100m for its green building efforts. 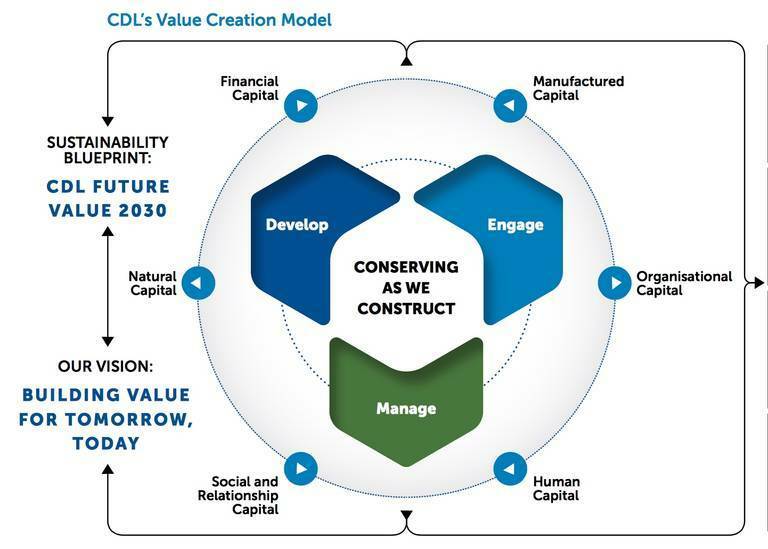 With its 2018 report, CDL has become one of the first Singapore companies to publish voluntarily its disclosures in the key areas of governance, strategy, risk management, metrics and targets, as recommended by the Task Force on Climate-related Disclosures, the advisory body set up by the G20. It intends this year to complete a study assessing climate risks and opportunities in its main operations as an aid to managing the financial impacts of its climate policy. A comprehensive study has been conducted to reassess the environmental, social and governance issues in the report. CDL listened to 160 stakeholders and an expert panel of senior representatives from international ethical organizations. Sherman Kwek, the CDL group chief executive, said: “Sustainability is fast becoming the norm throughout the business ecosystem. From a very early stage, CDL has recognized the importance of ESG integration. For more than two decades, we have incorporated sustainability into our business and operations to future-proof our business and unlock value.